Today’s ramble is mainly just an excuse for a few more photos of this extraordinarily photogenic place; there is a photo opp round every corner. The blue sky contrasted with white buildings is so aesthetically satisfying. We only have a camera phone, so quality is not great, but you get the idea. Despite the business it will bring, not everyone here is so chuffed with the direct Easyjet flights as they feel it will spoil the place even more than tourism has spoiled it already. 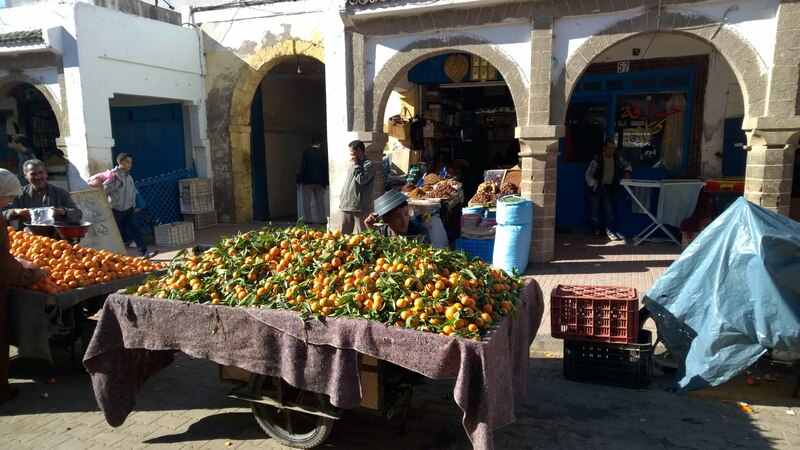 This is a double edged sword or employment, improved local facilities – this is hugely obvious from the years I have been coming here – tempered with the town being turned into some kind of Moroccan Disneyland of men in fezs and snake charmers (I have never seen a snake charmer in Essaouira – its too cool for that). 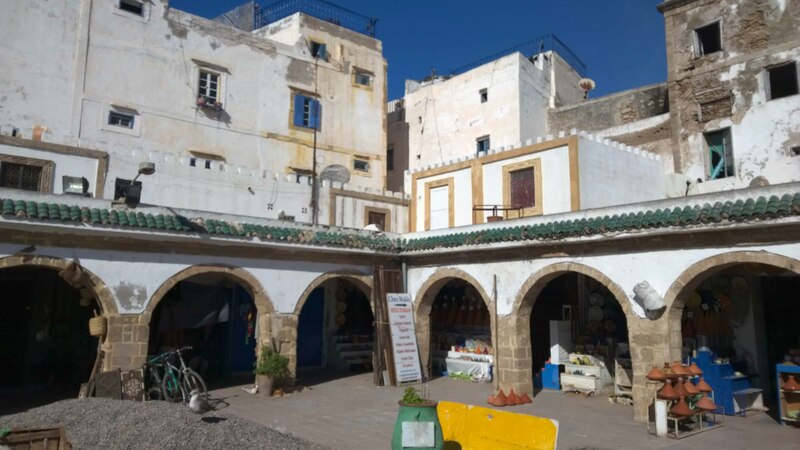 You can see why local people would take the tourist route, perhaps changing their shop from selling saucepans or couscous to selling spices or slippers, but they may destroy their community in the process. And community is one of the overriding things you notice about this place, and Morocco in general; its all about family and people. Eating, drinking and chatting. The streets are always full, especially at night, when everyone seems to come for a wander. It is a highly social lifestyle. With a risk of appearing idiotically patronising and making sweeping generalisations, my perception is that, one the surface at least, these are a happier lot than we are; less stressed (in a western sense of the world). More about people; less about things. 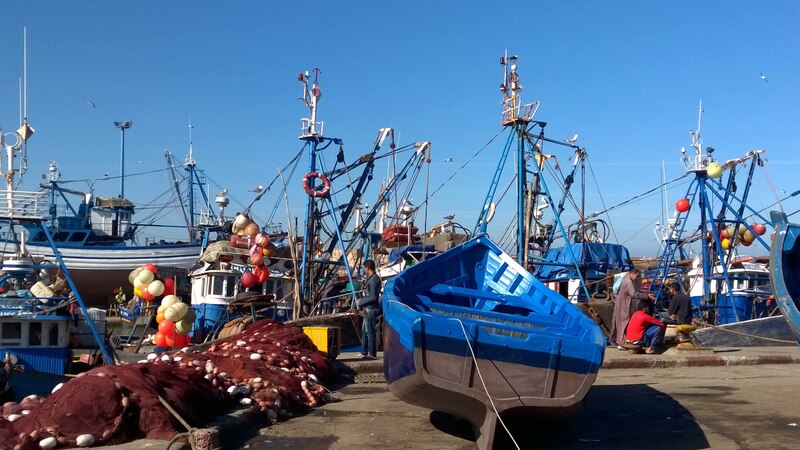 We wandered round the port with its boat building yard and numerous blue fishing boats of all sizes. 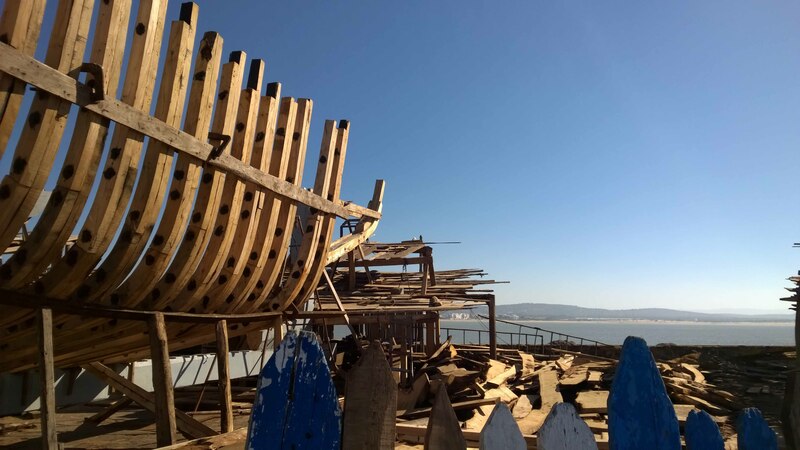 Due to the Atlantic winds, the sea is usually choppy outside the bay of Essaouira and you can often see these boats appearing and disappearing amongst the waves. I have always found Morocco a very safe place to be and have never felt in any danger, even late at night. 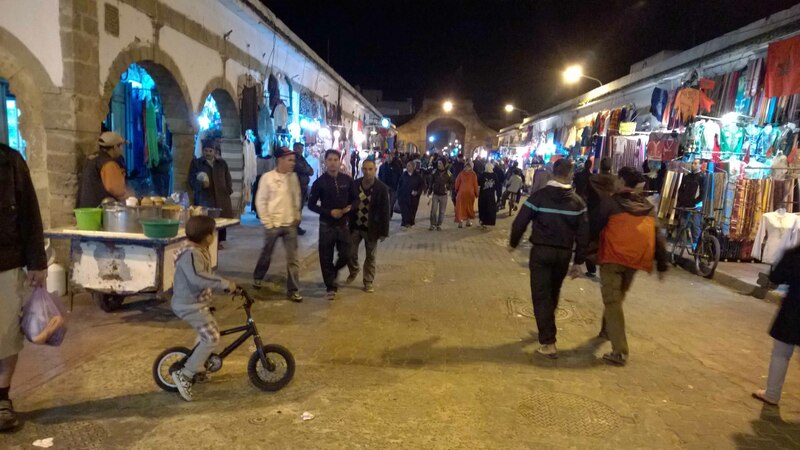 Obviously, there are places not to go at night in any city, but for me, the general absence of alcohol – you can buy it but most Moroccans don’t drink it – makes an evening out far more pleasant than in the UK. The atmosphere is completely different. Plus, as an added bonus, there are no Wetherspoons. Not one. Shopping is a slow mooch round shops selling different individual items; one shop only sells bottled water, nothing else. Many shops these days have set prices and shopkeepers appear to have largely abandoned the hard sell tactics of the past. I recall hearing years ago that the government had carried out some research where they found it that 85% of first time visitors to Morocco said they would never return due to the constant badgering. Huge amounts of money was spent on tourism and on TV advertisements explaining that European shoppers just like to be allowed to look. When I first came 13 years ago, the guidebooks would warn of harassment and scams to the point of making you terrified before you arrived. 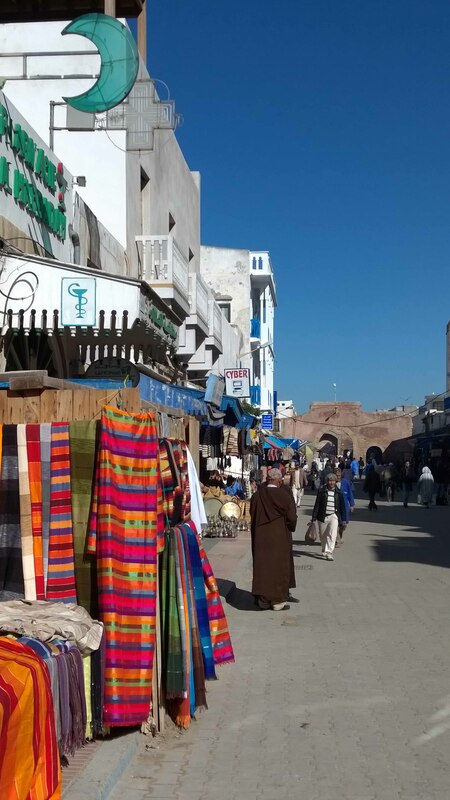 Morocco is nothing like it was, especially in laid-back Essaouira. 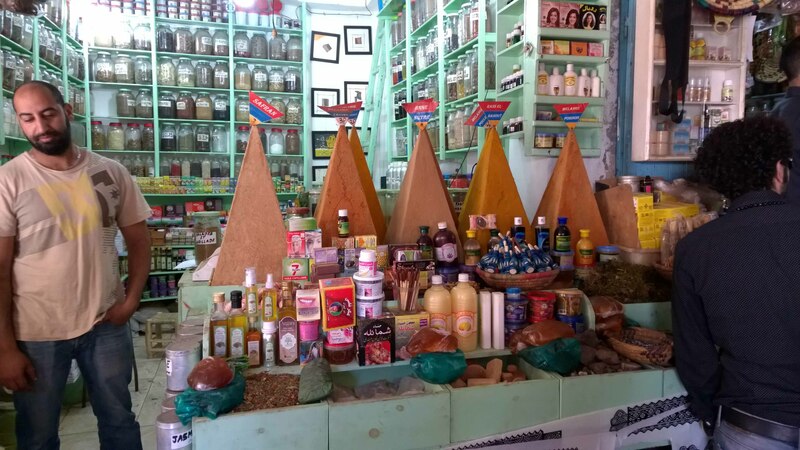 Beyond tagine spices and saffron, the spice shop sell a range of cures for all known ailments, including diabetes, weight loss and kidney stones. 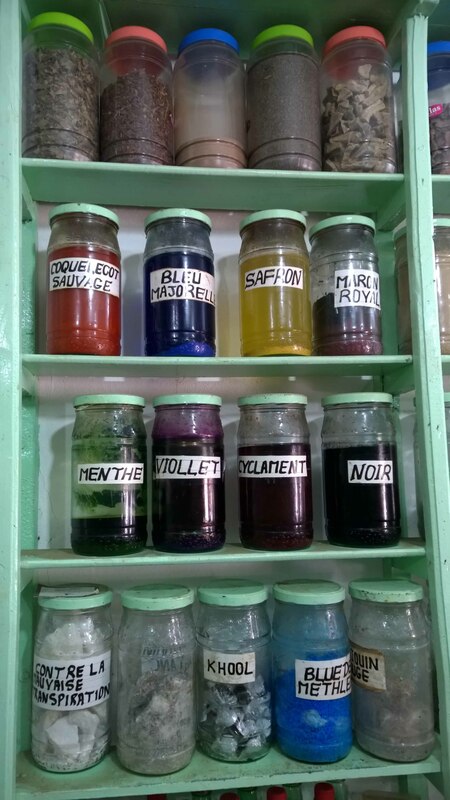 I am not convinced that these jars contain anything more than some sticks and dust off the floor, but the older generation particularly, swear by them. On the top shelf is where the black magic lies, should you wish to put a curse in your neighbour for forgetting to put the bins out. Bats and hedgehogs feature in these recipes. Oranges are around 12p a kilo. Fresh fruit and vegetables are incredibly cheap – a week’s worth would cost less than £1. Late night shopping is every night,although it seems more of an excuse to see and be seen. Snails, pyjamas and live chickens are but a few paces away. I hear that there’s something called Christmas going on in the western world. From friends posts on Facebook, it sounds stressful. We have escaped this final week to wander around in the winter sun. Christmas shopping? Slippers and tagine spices. Sorted. 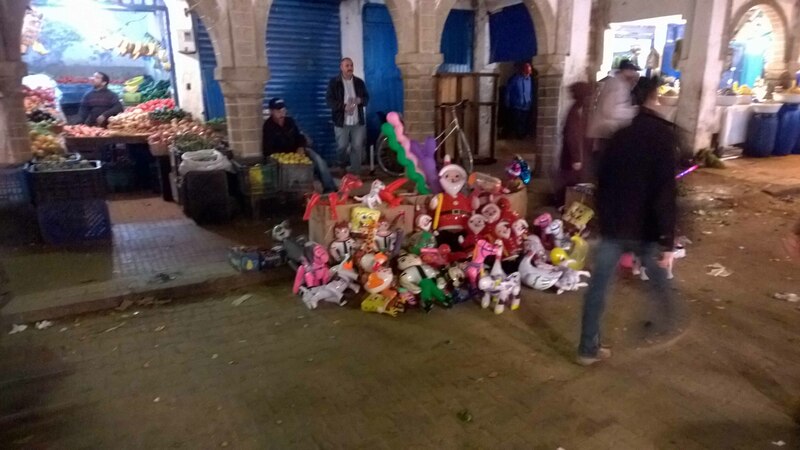 Here in Morocco, this is Christmas. One stall, selling a few inflatable Santas. That’ll do. The photo at the top of this page is of my land. Crazy, eh? It’s near the beach in a little place called Moulay Bouzerktoun, about 20 minutes drive north of Essaouira. It’s known only for windsurfing, kitesurfing and such and has a significant swell in the summer (so they tell me). In Europe, this hectare (2.5 acres) would be worth hundreds of thousands of pounds, here it cost less than the price of a second hand car (I don’t even remember how much). You could live on it in a little house, spend your life shifting rocks, counting tortoises and live on very little money. Morocco is full of such opportunities; for the medium brave. We thought about what adventures we could have building a house on the land overlooking the Atlantic; something we’d never be able to afford anywhere much else. We talked about lots of ideas and things, but then we found out that my Polycystic Kidney Disease has caused high blood pressure for the first time in my life (it’s the first thing to cause a problem for most people with PKD). Apart from back pain and almost constant headaches, it’s not affecting me too much so far. A health and fitness regime begins 2 days before Christmas in an attempt to get it under control (weight loss and excerise help lower blood pressure) before I have to give in and tell a Doc who will put me on medication for the rest of my life. I’d like to delay that as long as possible. I may be well for decades, I may not. We just don’t know, but we’re not taking any chances and wasting healthy time thinking we have plenty of it. We weren’t too sure about Moroccan medical facilities and we also remembered that we’re not very brave, so we went home and put an offer in on a little cottage in Portugal that we viewed some time ago. That’s a more sedate kind of adventure that we can handle. With hospitals. And they said Yes. We have a couple of Help Exchange / Workaway volunteering trips organised for the next few months, but after that, we’ll be being not very adventurous in The Algarve for many years to come. 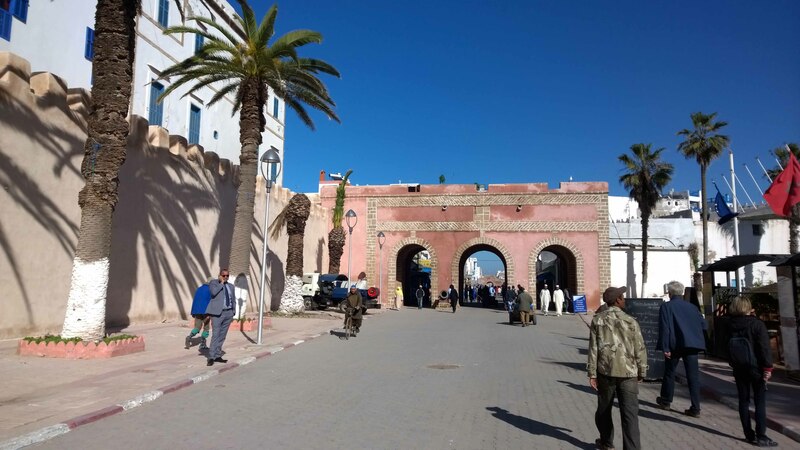 This entry was posted in Morocco, Travel and tagged Essaouira, Essaouira port, medina, Morocco, Moulay Bouzerktoun, PKD, polycystic kidney disease, souk, windsurfing Morocco. Bookmark the permalink. Great post. I don’t think the Easyjet flights will be a problem. It won’t attract the costa del sol crowd, and will make life a lot easier for frequent visitors. I’m hoping for a direct flight from Dubai next ! It is from Luton so not quite as easy for us south coasters. Ask Stelios, I’m sure he’d oblige!